Let Me Be a Woman is a book that will rock your world. 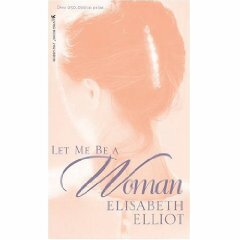 Elisabeth, through her brilliant writing, has helped me understand my role as a woman, equipping me to be the woman God has created and called me to be. Definitely a life transforming book. Please order yourself a copy and purchase one for a friend, you won't be disappointed at all.